This was such an easy yet elegant dish. It would be great for a brunch or lunch served with fruit or a salad. It could also be served as a main dish for dinner. On a lightly floured piece of parchment paper, roll out puff pastry to an 11 by 14 inch rectangle. Trim edges to make a neat rectangle and transfer pastry on parchment to a rimmed baking sheet. With a sharp knife, score a 1/2 inch border around edges. With a for, prick pastry all over inside border. Refrigerate 20 minutes. Preheat oven to 375 degrees. In a large skillet, melt butter over medium. Add onion and cook, stirring occasionally, until soft and golden, 10-15 minutes. Add mushrooms and tarragon and cook until mushrooms begin to soften, about 8 minutes; season with salt and pepper. Bake puff pastry until light golden, about 15 minutes. Remove from oven and top with mushroom mixture, staying within border. 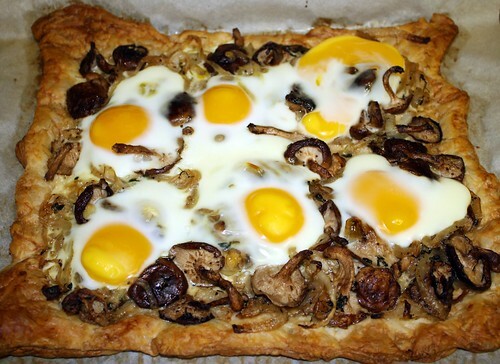 Carefully crack eggs on top of mushroom mixture, spacing them evenly, and bake until pastry is golden and egg whites are set but yolks are still runny, about 10 minutes. To serve, sprinkle with tarragon and Parmesan and cut into 6 squares. Posted on January 27, 2012 by cookingwithpizazzPosted in Main Dishes, Meatless Main DishTagged Brunch, Lunch, Meatless Main Dish.